Rising health care costs mean that health insurance premiums will be higher for next year’s Affordable Care Act plans. But there’s something you can do about rising premiums: Check the federal marketplace to see if you qualify for a federal subsidy to help you pay for a 2017 health plan. If you’re under age 65 and shop for your own insurance, you might be surprised at how much a subsidy can help you obtain the coverage you need. Let’s look at an example. A family of four in Halifax County bought a 2016 Silver plan for $1,454 per month for the whole family (before subsidy). Based on approved new rates, they can get a similar plan for 2017 for $1,876 a month (again, before subsidy). Now look at the effect of the subsidy: For the current year the family has been paying $276 per month, with the federal government paying the rest. In 2017 their payments will only be 26 cents a month more, or about $3 for the whole year. Of course, premiums without the subsidy would be a significant challenge for many people who purchase plans on the ACA Marketplace. The 24.3 average rate increase for 2017, on top of a 32 percent rate that took effect this year, is evidence that rising costs are not sustainable for the long term. Remember that the subsidy is simply a credit from the federal government. For those who qualify, it lowers the amount they pay out of their own pocket, but it does not reduce the overall cost of health insurance. 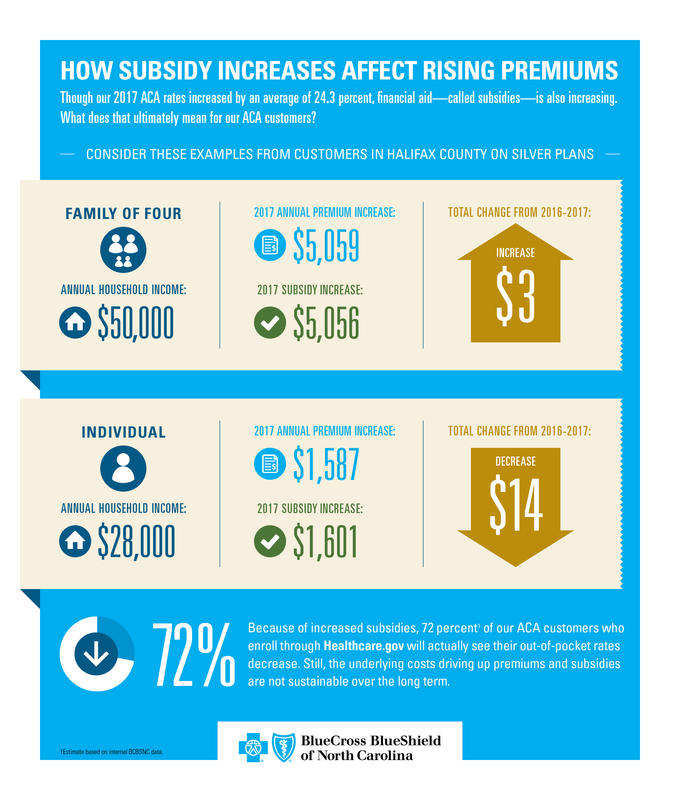 ACA premiums continue to rise because of the costs associated with providing medical care for people enrolled in ACA plans. These costs were also higher than we expected when we originally filed rates back in May. On average, ACA customers tend to require more medical services than most other customers, and have more chronic conditions that are costly to treat. They also have a higher volume of emergency room visits. 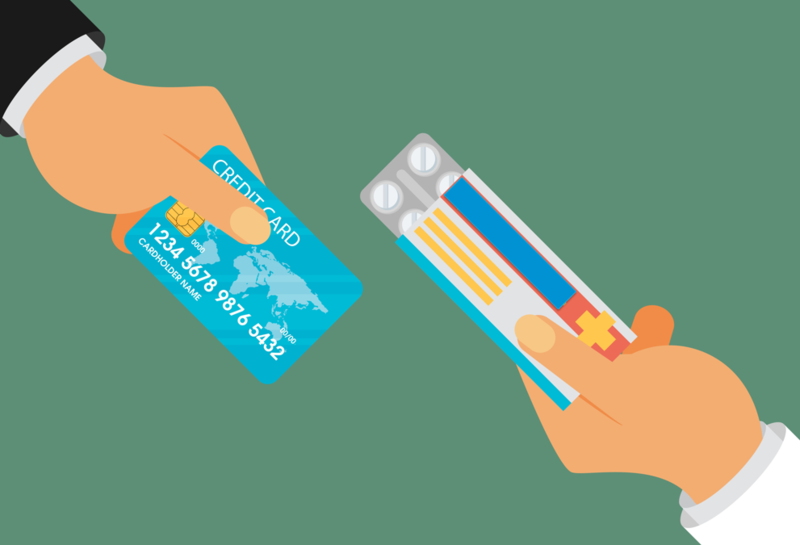 Many take expensive prescription drugs. At the same time, the ACA has not drawn enough younger and healthier people to pay into the system and balance out the higher-cost customers. Just a quarter of our 2016 ACA customers are age 18 to 34, while 60 percent are age 35 to 65. All of these issues are factors in setting premiums. They explain why average rates are going up 24.3 percent for our ACA business, which is still less than some other states. For example, Minnesota is seeing an average increase of at least 50 percent for next year, and Oklahoma is reporting a 76 percent increase. North Carolina was impacted in many ways by two major insurers dropping ACA plans for next year. Their decision not only prompted us to revisit our rates; an additional 260,000 customers will now need the same level of support as our current customers, if not more. Unfortunately, Aetna’s decision to exit North Carolina’s ACA market came too late for us to have the people and systems fully in place to ensure a high level of service for these new customers. With all of these challenges in mind, it’s important that consumers continue to have access to the health coverage they need. But we must continue to seek improvements in the ACA to make it more sustainable.